'Around the World in Eighty Days' is a spectacular comedy adventure film made in 1956 directed by Michael Anderson and produced by the Michael Todd Company. It was based on the 1873 classic novel of the same name by Jules Verne and the plot has become well known. A nineteenth century Englishman, Phileas Fogg, tries to win a 20,000 pound wager by travelling around the world within eighty days. He and his valet Passepartout are pursued by a detective, Fix, who believes Fogg has stolen the money. The film was a great commercial success, grossing some $33 million within 18 months of release, against production costs of $6 million. It was also well received by the critics and was nominated for eight Academy Awards, winning five, including Best Picture. The music score, composed by Victor Young, was nominated for an Oscar but strangely, the song, "Around the World", was not nominated although it became a hit for both Bing Crosby and Eddie Fisher and has since become an evergreen standard. 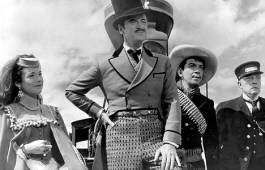 The main stars of the film are David Niven as Phileas Fogg, the upright Englishman who makes the bet that he can traverse the planet in 80 days, Cantinflas, the Latin-American comedian, who plays Passepartout, Fogg's servant. In a canny business move, Todd expanded Passepartout's role, elevating it to that of action-hero and drawing upon the Mexican superstar's popularity to generate huge ticket sales in Latin America. The other featured stars are Shirley MacLaine as Princess Aouda and Robert Newton as the mysterious detective Fix who had been dispatched from England in search of the bank robber. A remarkable feature of the movie is the amazing number of Hollywood stars who appear in small, cameo roles. These include John Gielguid, Frank Sinatra, Charles Boyer, Cesar Romero, Glynis Johns, Peter Lorre, Marlene Dietrich, Buster Keaton, neewsreader Ed Murrow and many more, some forty in all, adding a wealth of color and interest to the film. The movie was designed to be shown on special curved screens in theaters equipped with Todd-AO projectors, but to accommodate the many theaters without this equipment Todd shot two versions simultaneously each running at different frame speeds. The movie has been criticised as being too long but it is undoubtedly a masterpiece of beautifully shot Technicolour brilliance, displaying a fast-moving and engaging story line with superb acting. A wonderful family fantasy film. Production Company ... The Michael Todd Co.